Jonathan Lim, M.D., was only 31 years old when he was appointed Halozyme Therapeutics’ first president and CEO in 2003. During the previous two years, he was a management consultant at McKinsey & Company, advising C-suite executives of both start-ups and Fortune 500 companies in the healthcare industry. But, prior to Halozyme, which is headquartered in San Diego, Lim had not worked at a biotech or pharmaceutical company. “I was flattered but surprised when Audrey offered me the job,” said Lim, referring to the venture capitalist Audrey Viterbi, Ph.D., then CEO of Linkagene, an investor in Halozyme. “I didn’t find out until later that individuals who were more seasoned and qualified had already turned down the offer because they realized the company was nearly out of money.” Those other CEO candidates understood the challenges of quickly raising cash to fund operations. Lim did not. “I was unencumbered by knowledge or experience!” he joked. During his 2003 to 2010 tenure as president, CEO, and board director, Halozyme grew from five employees and a market value of $5 million to 140 employees and peak market capitalization of almost $1 billion. Under his leadership, Halozyme also became a publicly traded company, raised $300 million from financings and corporate partnerships with Roche and Baxter, achieved FDA approvals for two medical products, and launched clinical trials of six additional investigational agents. Three weeks after exiting Halozyme in December 2010, Lim launched a healthcare investment company, City Hill Ventures, at which he founds, funds, and leads life sciences companies. Eclipse Therapeutics, the first company he cofounded, was a Biogen Idec spinoff focused on therapeutics targeting cancer stem cells. City Hill was Eclipse’s lead investor, providing $500,000 of seed capital. Eighteen months after it opened its doors in March 2011, Eclipse was successfully acquired for $10 million up front and up to $65 million in cash earn-outs by Bionomics, a global publicly traded biopharmaceutical company headquartered in Australia. Lim, chairman and CEO of Eclipse prior to the acquisition, now serves on Bionomics’ board of directors. When they launched Eclipse, Lim and his cofounders did not plan to sell the company so quickly. The acquisition resulted from a strategic process Eclipse undertook in 2012 when it needed cash to fund its growing operations. “Taking nothing for granted, we pursued multiple options in parallel by dual-tracking our financing and M&A discussions with VCs and biopharmaceutical companies, respectively,” he said. “We did not have a preference a priori for the VC versus acquisition path. In the end, we selected the option with the best prospects for creating value for our investors.” The up-front payment alone earned a greater than 300 percent internal rate of return on the investment for City Hill, Eclipse’s primary investor. Ignyta was cofounded in 2011 by Lim and internationally renowned rheumatologist Gary S. Firestein, M.D., to create an early molecular diagnostic assay for rheumatoid arthritis (RA) based on the epigenetics research of Dr. Firestein’s lab at UC San Diego. However, the assay failed to perform in a critical clinical study conducted in April 2013. The negative results were “so clarifying that we were forced to reconsider our business model,” said Lim. In addition, growing uncertainties about reimbursement as well as regulatory and intellectual property matters were challenging the molecular diagnostics market. Lim and his team deliberated on various alternatives for Ignyta, including closing the company and distributing funds back to the shareholders. Because of the negative data and macroenvironment issues, the option of continuing the status quo was immediately ruled out. They instead decided to reinvent the company by quickly executing what Lim described as a strategic pivot that transformed Ignyta into a precision medicine company to concurrently develop therapeutics (Rx) and companion diagnostics (Dx) for cancers with specific oncogenes that are known to drive the growth and spread of tumors. Ignyta’s transformation into an integrated Rx/Dx company could not have occurred so quickly if not for its merger with Actagene Oncology less than three weeks after Ignyta’s negative diagnostic assay results. Actagene, another San Diego start-up funded by City Hill, was cofounded by Lim and Patrick O’Connor, Ph.D., former global research therapeutic area head for oncology at Pfizer. Actagene, at which O’Connor was CEO, was trying to raise $5 million. Ignyta had $5 million in its reserves. The companies’ respective boards agreed to merge the two companies in May 2013, just four months after Actagene’s founding. The merged company retained the Ignyta name. Lim described the merger as a synergistic combination of the two companies’ genomic and epigenomic databases and Rx and Dx discovery and development capabilities. In 2013, Ignyta also became a publicly traded company and in-licensed two compounds, one clinical and the other preclinical, from Nerviano Medical Sciences, a former oncology drug discovery facility of Pharmacia and Pfizer in Italy. The clinical-stage compound, entrectinib, is Ignyta’s lead program. Under evaluation in two Phase 1/2 clinical trials, entrectinib received the FDA’s orphan drug designation for nonsmall-cell lung cancer, colorectal cancer, and neuroblastoma, as well as a rare pediatric disease designation for neuroblastoma. As early as the third quarter of 2015, entrectinib could be in a pivotal registration-enabling study. In late 2014, Ignyta encountered a new growth opportunity. Teva Pharmaceutical Industries had decided to shift its strategic focus from oncology R&D and was selling four of its experimental compounds. One of those compounds was RXDX-105, which had a unique profile that inhibits three cancer-driving gene alterations that are activated in nonsmall-cell lung cancer, colorectal cancer, and other solid tumors. “We knew what kinds of complementary therapeutic opportunities we were looking for, so as soon as we became aware of the Teva oncology R&D pipeline coming up for sale, we mobilized a multidisciplinary, 20-person ‘SWOT team’ to complete our initial due diligence,” Lim said. The competition for these compounds came from several biopharmaceutical companies and VCs, many of which were larger and had deeper pockets than Ignyta. Seventeen days after creating that specialized team, Ignyta presented its proposal to acquire the four Teva drug candidates. Nine weeks after that (March 2015), Ignyta and Teva signed and announced their agreement. Ignyta also raised $42 million in financing that closed concurrently with its acquisition of the Teva assets. RXDX- 105 is now in an Ignyta-sponsored Phase 1/2 clinical trial. "One of the greatest challenges of entrepreneurship is knowing when to keep going, quit, or change direction as a company when times get tough." Today, Ignyta has over 70 employees and a pipeline of six clinical and preclinical oncology compounds, all potential targeted cancer drugs and novel chemotherapies. Ignyta’s pipeline agents will keep Lim and his team busy while the company’s in-house scientists develop other compounds. Ignyta’s pipeline targets the majority of the molecular alterations known to drive the growth and spread of multiple solid tumors. Before enrolling individuals into its Phase 2 clinical trials, Ignyta plans to use its in-house diagnostics lab to screen patient tumor specimens for the molecular alterations targeted by the company’s product candidates. Ignyta also will use the lab to periodically monitor the tumors’ responses in the clinical trials. An in-house diagnostics lab that is CLIA (Clinical Laboratory Improvement Amendments)-certified and compliant with QSR (quality system regulations) is one of Ignyta’s distinguishing features, Lim said, and the company believes it provides a competitive advantage. 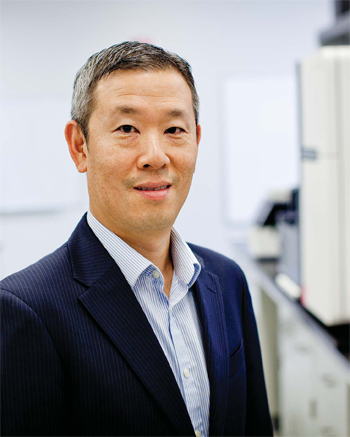 “Most oncology biotech companies rely on an outside diagnostic company to develop companion diagnostic assays for their drug candidates,” Lim commented. Investors have responded positively to Ignyta’s transformation into an Rx/Dx precision oncology biotech company. More than $180 million has been raised since the company’s inception. As of May 1, Ignyta’s market capitalization was over $225 million. Lim has a 20-year vision for Ignyta to become the leading precision medicine company in oncology. WHAT WOULD JONATHAN LIM, M.D., SAY TO SOMEONE WHO ASPIRED TO BUILD AND LEAD A LIFE SCIENCES COMPANY? Obtain an M.D., Ph.D., J.D., or M.B.A. degree. “Studying for an advanced degree trains your mind and gives you credibility and the capabilities to handle different situations,” he said. After receiving his M.S. degree from Stanford University and M.D. degree from McGill, Lim trained in general surgery at the New York Hospital/Cornell Medical Center and Memorial Sloan Kettering Cancer Center. He subsequently completed two years of NIH-funded postdoctoral training at the Dana Farber Cancer Institute while studying for an M.P.H. degree in healthcare management at Harvard University. While at Harvard, he also took a business school course on entrepreneurship and founded a short-lived electronic medical records dot-com named MDscope, which was unsuccessful in raising money during the dot-com bust in late 2001. “One lesson I learned from this experience was that, to make something work, you have to work on it full-time on a 24/7 basis, not just nights and weekends on the side while pursuing a full-time job or classwork in school,” he explained. Early in his career, he also conducted both basic and clinical research at the Salk Institute for Biological Studies in La Jolla, CA, and the Massachusetts Eye and Ear Institute in Boston. “These multidisciplinary experiences have allowed me to appreciate the business, scientific, and medical considerations involved with building and growing a biotechnology company,” he said. Lim encourages individuals who want to be entrepreneurs to take the leap at a stage in your career when you can afford to do so, but don’t wait too long. “Putting all of your efforts and energy into an entrepreneurial venture and having your livelihood depend on it are very clarifying experiences,” said Lim. Leading Halozyme was his defining experience in learning about entrepreneurship. “Entrepreneurs must have the passion, commitment, and empathy to motivate people around a common vision and achieve ambitious goals collectively as a team,” said Lim, who regards his training as a physician and his numerous interactions with patients and other healthcare providers as helping him to develop effective interpersonal skills. At Ignyta, Lim gives every employee and board member the book “True North,” by former Medtronic CEO Bill George, because it “articulates a holistic theme of authentic leadership, including being true to yourself and to others, in order to be a more effective leader,” he said.